Have you ever seen a DIY project and thought to yourself – why haven’t I thought about it? Some DIY decor projects are so ingenious that they’re absolutely a must-do even if you don’t usually take up handcrafts. These 15 easy DIY home decor tips and tricks are simple yet each and every one of them solves a problem at home that begs to be solved. We encourage you to look at them and by all means, try them at home. It just may be that your home decor will never be the same again. Tiered trays are incredibly useful not only in dinner parties but as centerpieces or bases for decor vignettes too. Make one from picture frames and you have a new whimsical decor feature for your home. If there’s a way to make mason jars for storage of small things even better, that’s adding crystal knobs to their lids. They certainly make fancy containers with a little bit of glamour. The problem of missing socks is always an issue so why not make a decor statement of it? This sign for the laundry room is just a brilliant wall decor idea. A trash can is never a pretty sight and you’ll always do good to hide it in your home decor. But it also has to be quickly accessible to serve its purpose. This tilt-out cabinet idea is simply genius. There’s something brilliant in the simplicity of this design. It adds this rustic industrial feel to your decor and makes the perfect option for anyone who’s going for a minimalist look. Looking for a way to organize your kitchen utensils in a chic style? Check out this tin can organizer idea that brings retro style to your kitchen in pastel colors, metallic materials and round shapes. This technique will change the way you look at embellishing furniture. Painting is the most straightforward way to give new life to that old dresser but once you start thinking about transferring images onto its surface, DIY decor gets a whole new meaning. Give your doors a vintage look by adding ceiling medallions as an embellishment. That certainly makes a strong chic statement in home decor. 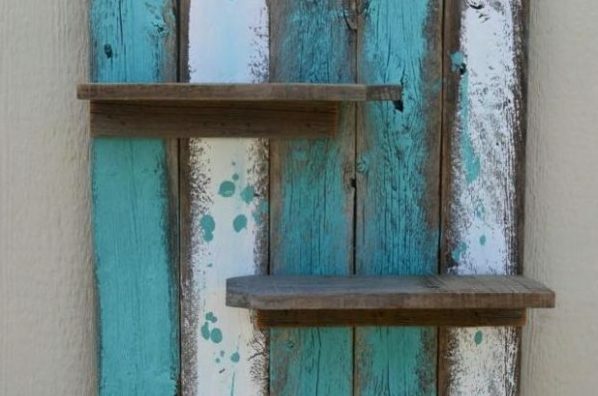 What’s so great about this little pallet shelf project is that it’s pretty simple – it gives you that rustic look and provides with extra shelf space for storage and display in a non-committing way. These DIY box cubes are brilliant for shelving as they are easy to build and provide you with a very flexible storage solution. Rope makes a great material for wall signs and you can get this adorable rustic style art for your home decor quite easily. Make pretty mason jars to be used as vases in this beach motif – it looks almost like stained glass and makes a beautiful decor statement. These hanging herb jars make a brilliant way to have a fresh herb garden in your kitchen while saving space. An empty side of a cabinet or a wall is all it takes. If you’re going for a chic rustic feel in your home decor, the weathered wood look is your number one tool to achieve it. And here’s how you do it. A few inches between sofa and the wall is all it takes to revamp the space behind the sofa completely. Forget the sole wall art way and add another dimension to your decor.